The winds buffet red sails as the sun sinks lower in the sky, almost suspended at the horizon above a purple sea, with white foam crowning the waves that reach towards the rocks and stretches of white sand. The scene is a memory, a jumbled mass of light, shapes, and color. Were the sails white? Were the buoys red? Or is this design based on something else entirely, perhaps a street scene or a favorite song? 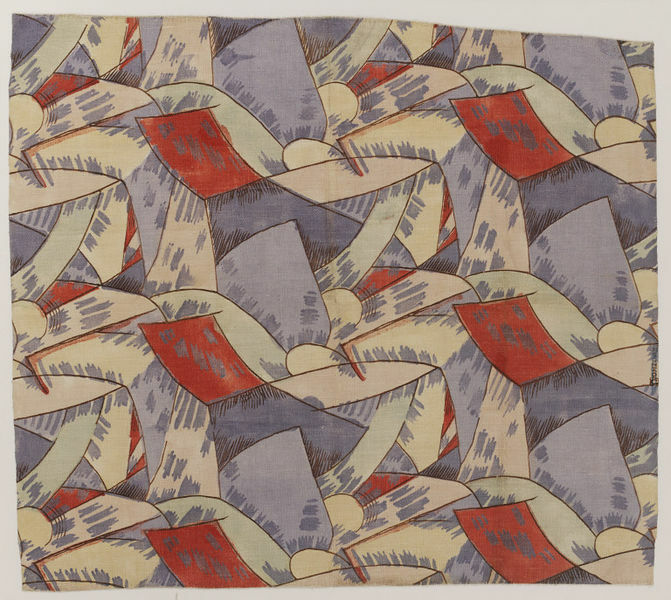 This textile, a perfect example of abstraction, bears an equally obscure title. A product of the 20th century, it shares its name with a pharaoh who ruled during the 18th Dynasty. Perhaps the design includes purple cap-crowns? What erudite artist designed this lively textile? To what group did he belong? Think you know? Submit your guess below; we’ll reveal the answer on Thursday! This entry was posted in Mystery Mondays and tagged mystery monday. Bookmark the permalink.